All Trimetals products have been designed for simple self-assembly and are supplied with clear step by step instructions. All parts are precision manufactured ensuring they accurately fit together and many of the major components for our storage units, patio boxes and bicycle stores are supplied factory assembled making construction even easier. Trimetals’ commitment to a 25 year guarantee is your assurance that our range of buildings are the very best available. Trimetals buildings have a 25 year replacement guarantee against rust perforation on all undamaged PVC- coated panels. 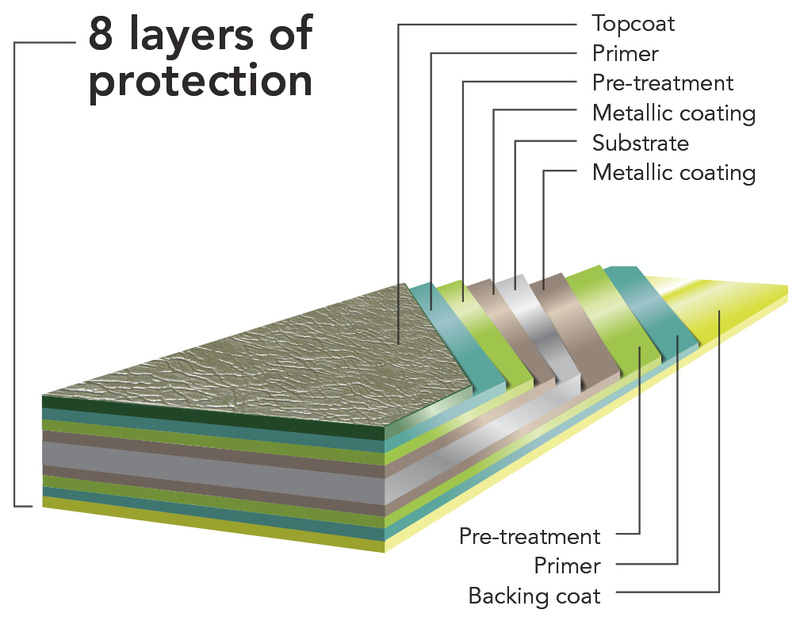 The diagram below illustrates the composition of the maintenance-free panel material. All buildings are precision manufactured from modern PVC-coated galvanised steel which is approximately 50% thicker with twice the paint thickness of most comparable products.This material is also maintenance-free and fire-resistant. A Certificate of Fire Conformity is available on request and supplied with each product.